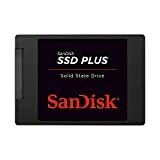 Okay fine, so a SanDisk SSD PLUS Solid State Drive might not make ANY old PC feel brand new, but if you have a computer from this decade then it definitely stands to benefit from this major upgrade. Computers slow down as they get older. That’s just how things work. What many people don’t realize is that buying a new PC isn’t the only option when your current computer slows down too much to bear. Upgrading the RAM is always a good idea, but today’s Amazon deal on SanDisk SSD drives will have just as much impact. You can snag a SanDisk SSD PLUS 120GB Solid State Drive for just $35 right now, which is $30 off retail. Or, you can double the storage with a SanDisk SSD PLUS 240GB Solid State Drive for $49.99. Your computer will boot faster, apps will open faster, and everything will feel more responsive. Trust us, a good SSD from a company like SanDisk is a must-have for any PC.